Wimbledon kicks off this week! Wimbledon is synonymous with strawberries: strawberries and cream... strawberries in Pimms... but, surprisingly, strawberries are pretty ace in a salad too. I know it may sound a bit weird but fruit can be delicious in a salad. Combined with creamy avocado and crunchy seeds, this strawberry salad works really well as a summer lunch with some added protein. Wash, dry and halve the strawberries. Peel and stone the avocado and chop it into chunks. Peel, halve lengthways and finely slice the shallot. 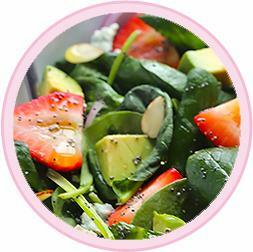 In a bowl, combine the strawberries, avocado, spinach leaves, shallot and pumpkin seeds. In a small jar, shake together the poppy seeds with equal measures of lemon juice, olive oil and honey (optional). Pour the dressing over the salad and toss to combine.